This brand new cannabis chair has been designed to give serious smokers the most high class smoking experience they’ll ever have. When it comes to puffing in luxury, this is as good as it gets. The chair is designed by German company El Purista. It’s called the RA 1:15. But don’t let the chair’s lackluster name fool you. 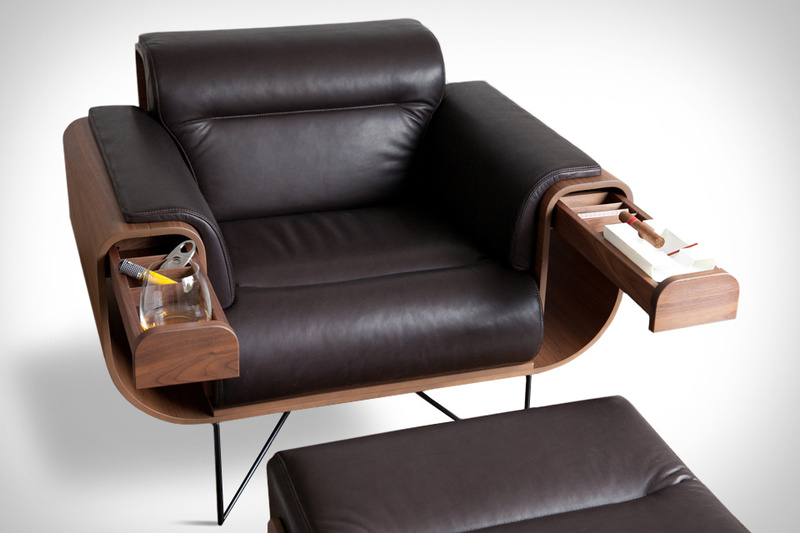 This is some seriously top shelf, one of a kind sh*t.
The chair is made out of all natural leather and hand-crafted wood. But this chair isn’t just beautiful to look at. It’s also super comfortable thanks to its high quality, super soft yet supportive cushioning. While all of this is good, we haven’t even gotten to the best part yet. Here’s where the RA 1:15 really separates itself from the crowd. The RA 1:15 has been carefully designed to be the ultimate at home smoke spot. The arms of the chair pull out to reveal a series of storage compartments. These compartments are perfect for storing your stash and all the equipment you’d ever need. Keep your grinder, pipes, bowls, lighters, rolling papers, and whatever else in these pull out compartments and you’re always ready to light up. The chair even comes with its own ash tray so you can cache out your bowl and reload all without ever getting out of your seat. Trust us, a smoke sesh in this thing means you’re not going anywhere. The RA 1:15 gives a whole new meaning to “couchlock.” Getting high has never been so stylish, comfortable, and luxurious. The armchair is the brainchild of Chilean architect Rodrigo Gonzalez and a German lawyer named Alexander Sauer. While the chair’s official promo materials market it as the ideal chair for cigar smokers, we all know that the best possible way to put this chair to use is as the cannabis connoisseur’s ultimate smoking throne. For anyone lucky enough to get one of these high class armchairs, we suggest starting out with one of our top 4 perfect weekend strains for a truly amazing, relaxing, and inspiring experience. Take a few hits on some indica dominant Cheese, some high THC Power Plant, a little killer Chronic, or some relaxing Ace of Spades, sit back, and melt away into luxurious bliss. The RA 1:15 cannabis chair looks like a regular armchair. But it’s actually been designed to hold everything you’d need for an incredible smoke sesh. The cannabis chair has compartments for storing everything from your stash to your piece to an ash tray.